Let’s ride! 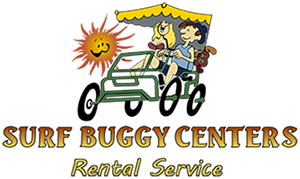 You’ll find Ocean City’s largest variety of bikes and surreys at Surf Buggy Centers, located at the rear of JiLLy’s Arcade. Pick a stylin’ ride among our large selection of rentals including 3, 6 and 9-passenger Surreys, adult bikes, kid bikes, beach cruisers, tandems, strollers and more. Available hourly, daily or weekly, our rentals are a perfect way to get in some exercise while taking in the views of the beach and Boardwalk shops. Our prices are the most competitive in town and we offer free parking with your hourly rental, compliments of JiLLy’s Arcade. Cruise in and rent some wheels today!